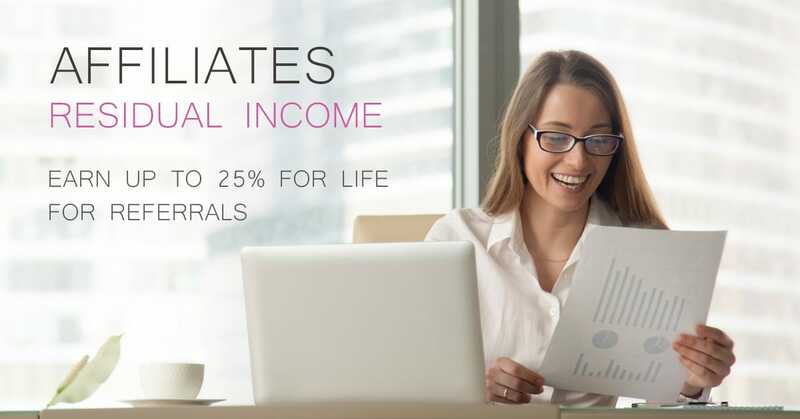 The Elements Life affiliate program is a lifetime residual passive income program that allows you to earn up to 25% of the lifetime monetary value of a customer you refer to our store. Terms and conditions apply. Most affiliate programs pay you a commission on a customer’s first sale. Refer a customer to us once, and earn up to 25% of every single order they place in our store. Focus on products that get ordered monthly and get paid a commission for every recurring order placed by customers you referred without having to do any additional work. What commission tiers do you use? Can I create custom links for my website? How do you pay out my commission? How can I earn lifetime commissions? How do you support your affiliates? Is there a signup or membership fee? Referral commission tiers are based on the amount of commission you have earn in total after joining the Elements Life Affiliate Program – this includes one-time purchases as well as residual commission from recurring purchases. Every affiliate has a standard referral link. However, this link can be customized with a unique identifier (business name, etc) and be further customized to link to any product page in our store. We also allow our affiliates to register their domain name in our system, so that any inbound link to our store placed on an approved website will automatically be linked to the corresponding affiliate account. This is a simple and effective way to link to any of our products without the link even looking like a referral link. We process all commission payments via PayPal on the 10th day of each month or the first business day after the 10th when it falls on a weekend or holiday. As long as you are an Active Affiliate in our program, any customer you refer will earn you a commission whenever such customers purchase a product in our store – be that now, next year, or 10 years from now. In order to remain an active affiliate, your referred customers must make a minimum of 3 separate purchases in our store during a given calendar year. We maintain an account dashboard with pre-approved product images to simplify the sharing on your website and on social media. This is very helpful if you want to use more than just a link to attract potential referrals. We also continuously work on new product innovation and add additional products to our store to allow our affiliates to offer a diverse portfolio of items which resonates with a large demographic audience. No, our affiliate program is free of charge and easy for anyone to join. To sign up, visit our Affiliate Registration page.